Sometimes you can travel without even leaving your hometown. 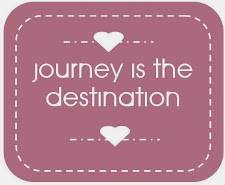 That usually happens when a friend comes to visit you: the first exciting part is choosing the itinerary to show her/him, in order to include all your favourite places - those that are meaningful to you, those that you find prettiest, but also those that you think she might particularly enjoy. And this part already requires an exercize of seeing your city with another kind of glimpse from the one you can have everyday, because you have to think about what is beautiful about it, what is valuable, what is special. But then it's when you actually put in practice this plan, and start exploring your surroundings with your friend that the adventure really begins - because you start seeing everything with new eyes, with the eyes of someone that doesn't see your city daily, that maybe even sees it for the first time, and then it can happen: you will be able to discover things you had never found out before, and, what's perhaps even more interesting, giving a different shade to the things you usually do. [*] ...Did you know that riding a carousel can be funny as an adult as well?? 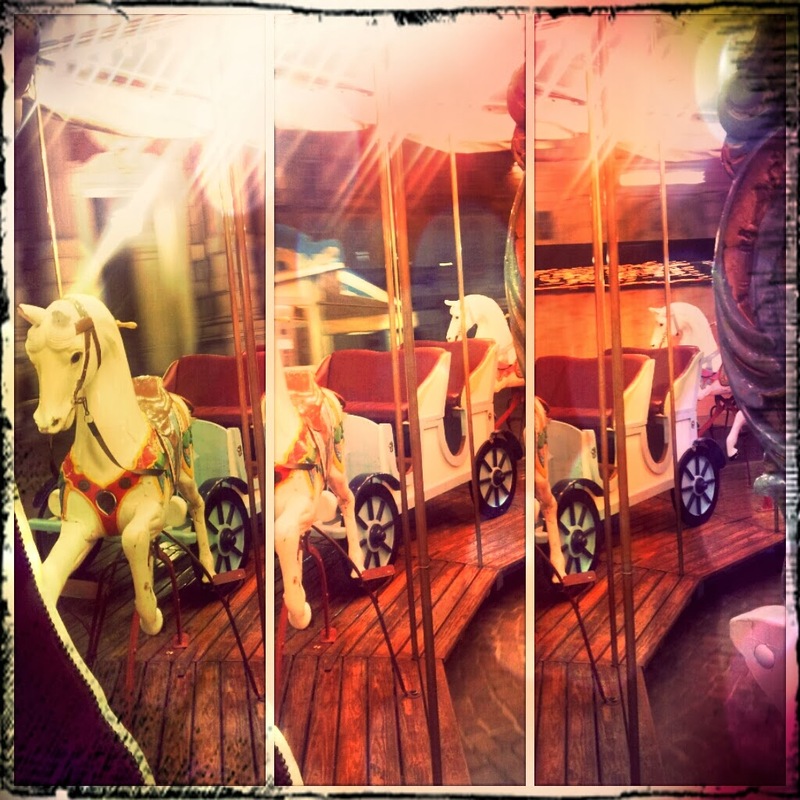 When we saw this pretty vintage carousel installed in Piazza Carlo Alberto we just fell in love with it. 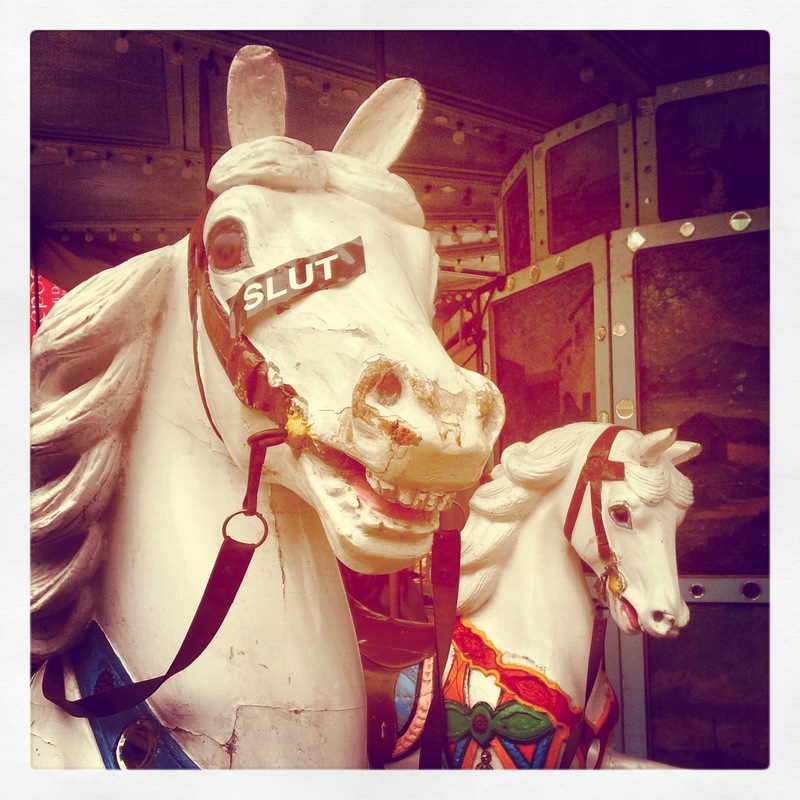 Vintage carousels are one of my photographic soft spots (I expecially like the one on London's Embankment) - but then why not even riding one? How surreal: at the cashier selling the tickets there was a kid in that moment, and we were two adults buying a ride from him for a merry-go-round - it normally is the contrary, isn't it? But this role swapping turned out to be funny - and letting out the little kid inside of you is usually pretty much healing! By the way, on a peculiar note I should add that when I was actually a child I didn't much enjoy carousel ridings - no particular reasons, I just didn't find particularly amusing. 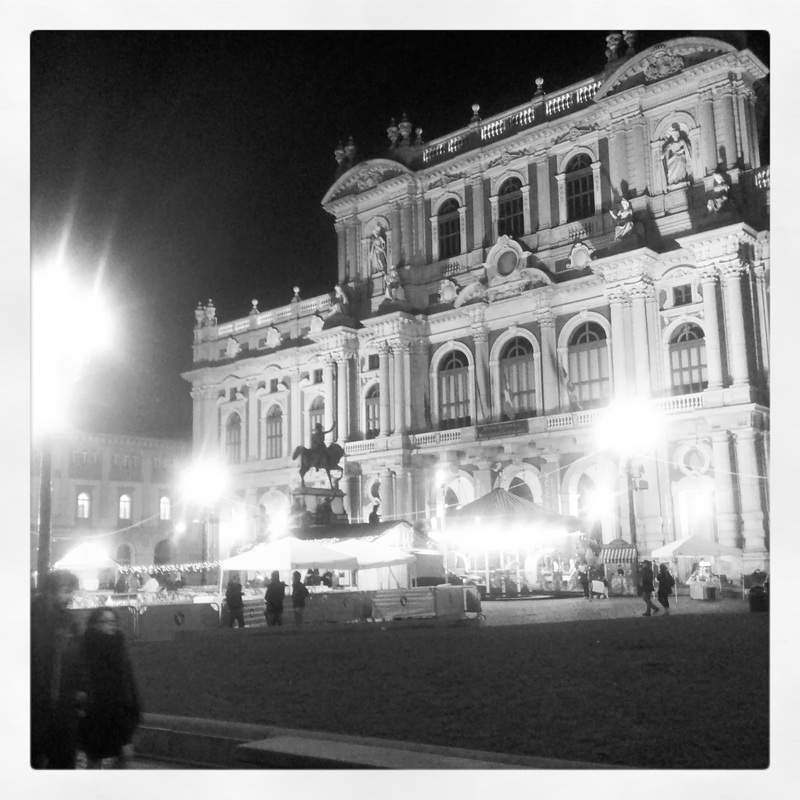 [*] ...Did you know that Turin & books have a great bond?? Of course I do. I'm a bookworm. Bookstores stay to me just like Manolo Blahnik stays to Carrie Bradshaw. I could star in "Book & the City", if they'd ever shoot it - and "The City" would be Turin for sure: we have the best bookstores, trust me. 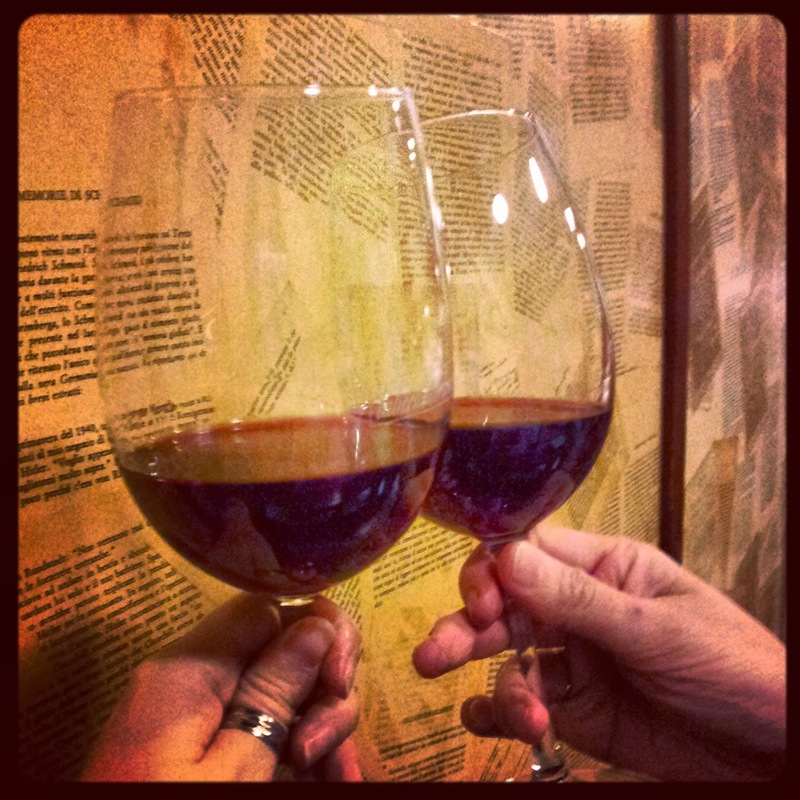 But - what I didn't know was this lovely cosy place called Taberna Libraria (via Bogino 5) where not only you can enjoy good wine and good local food, but also the fact of being surrounded by piles of books, books' quotes on the walls and books' pages glued to the walls. 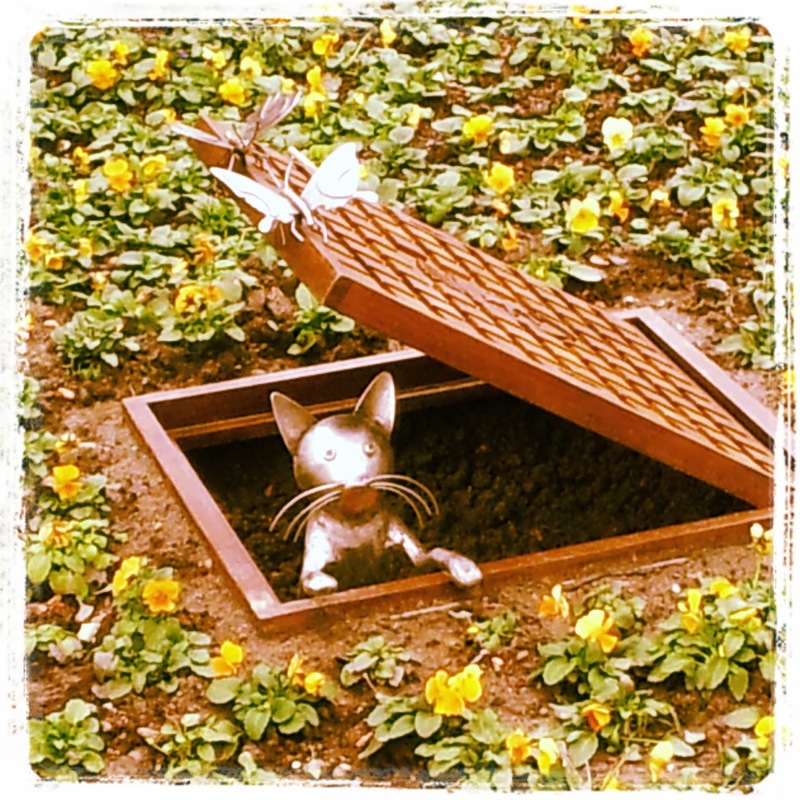 [*] ...Did you know that there were cats peeking from the manholes of Piazza Castello? 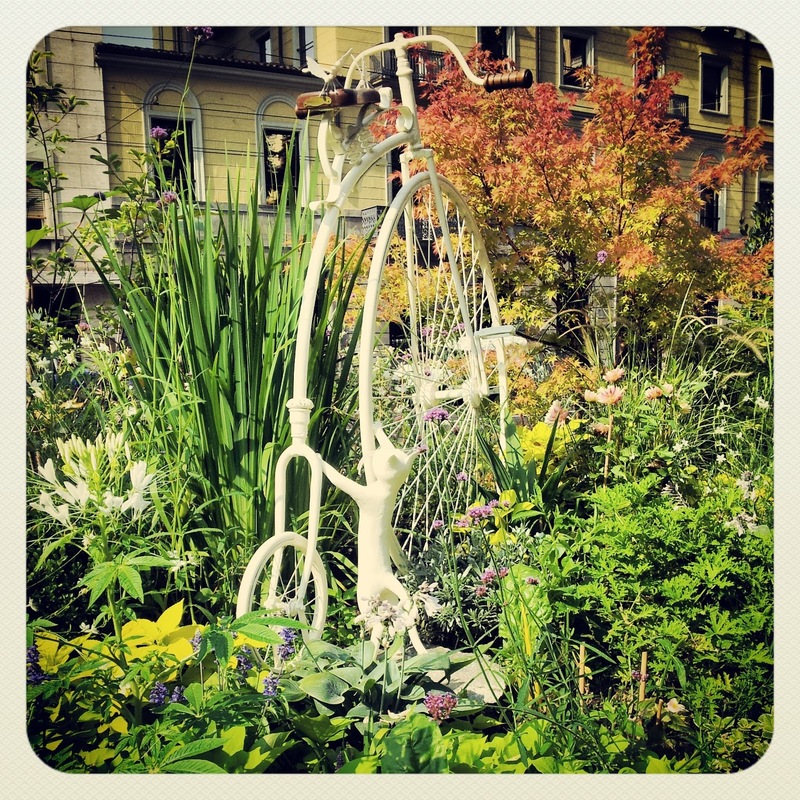 And that Turin Municipality's gardeners are talented artists?? 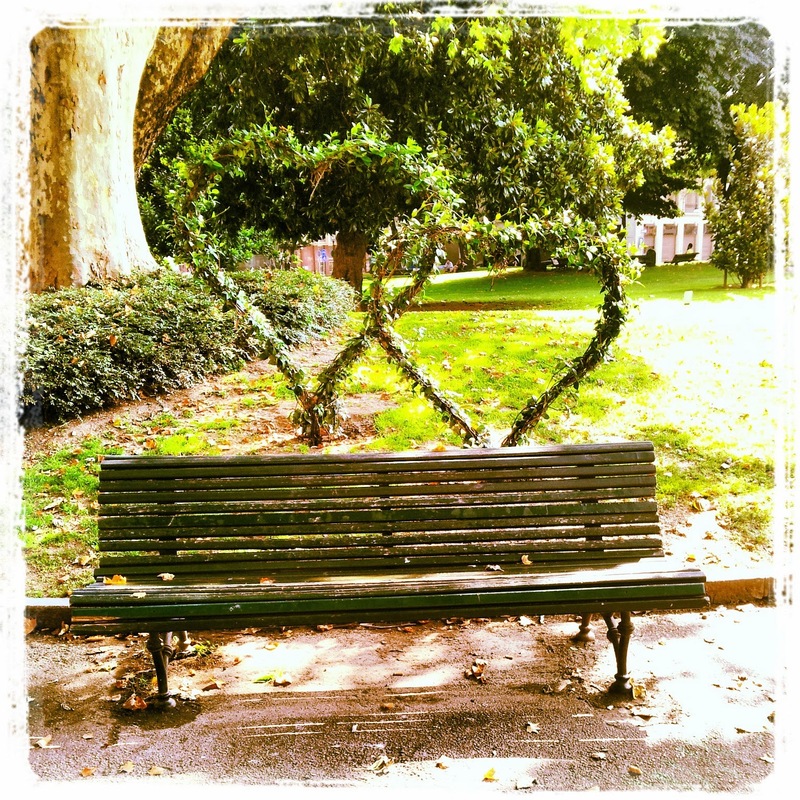 I had already seen a gentleman sitting on a bench in Giardini Lamarmora, holding a rose in his hand and waiting for his beloved one to arrive. I had even thought that it was me the one he was waiting for. And I had seen a cat chasing butterflies on his velocipede bike. 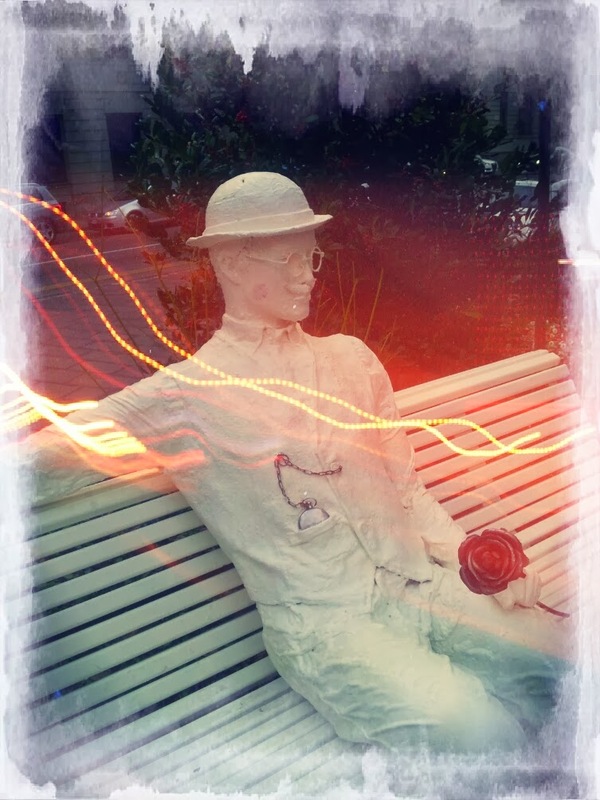 Oh, and there were hearts behind another bench, where perhaps the forementioned chalk-white gentleman would move with his belle when she will make him stop waiting. And I loved it all: it's a small, poetical little world apart, and it's so beautiful that someone having talented hands and a gentle heart gave us a little glimpse of it. So it's been a nice surprise to spot another corner of this little world in Piazza Castello as well. 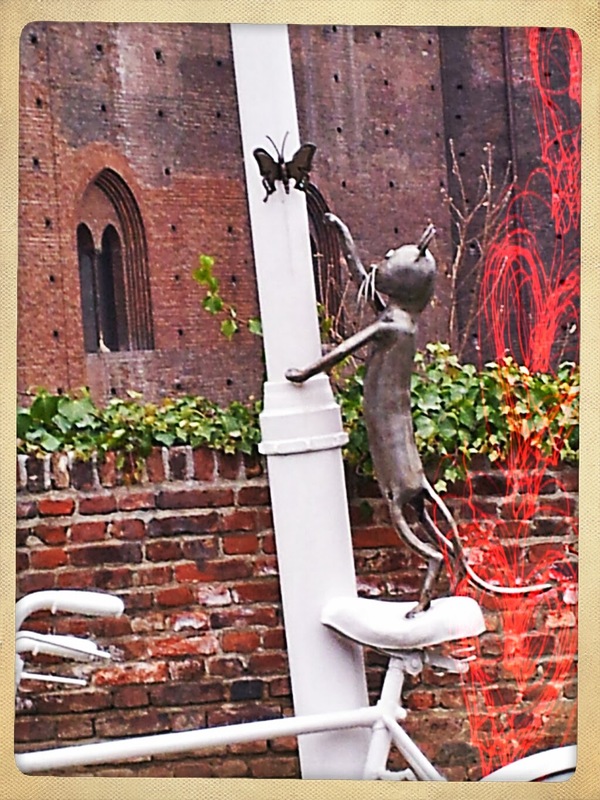 The beautiful installation of the cats with the bike and the streetlamp (...my top 3 photographic soft spots all together - what could I ask for more??) has been made by the gardeners of Turin Municipality with recovery material. And with lots of poetry! 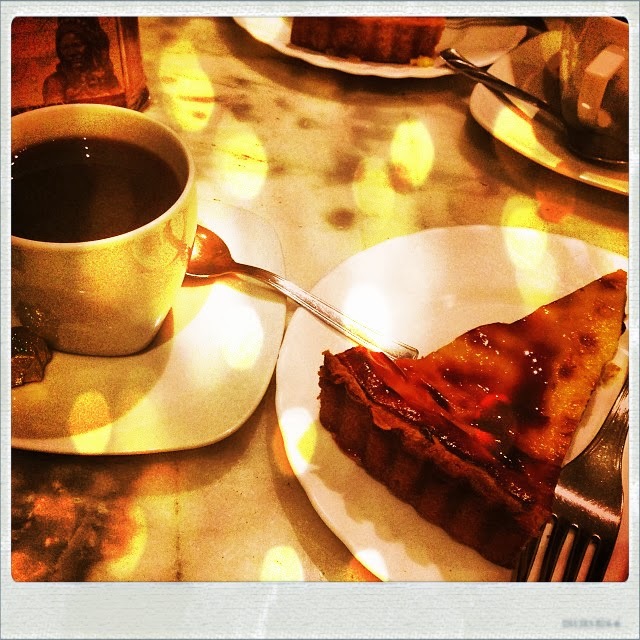 [*] ...Did you know that at Olsen's it's a feast even if you just have coffee & cake?? Well, ça va sans dire. Olsen (via Sant'Agostino 4) is one of the cosiest slices of heaven on earth: they make cakes (ok, and also other things - but, actually, we all go there for the cakes) - both savoury and sweet, and it's really really hard to say which ones are the most delicious. 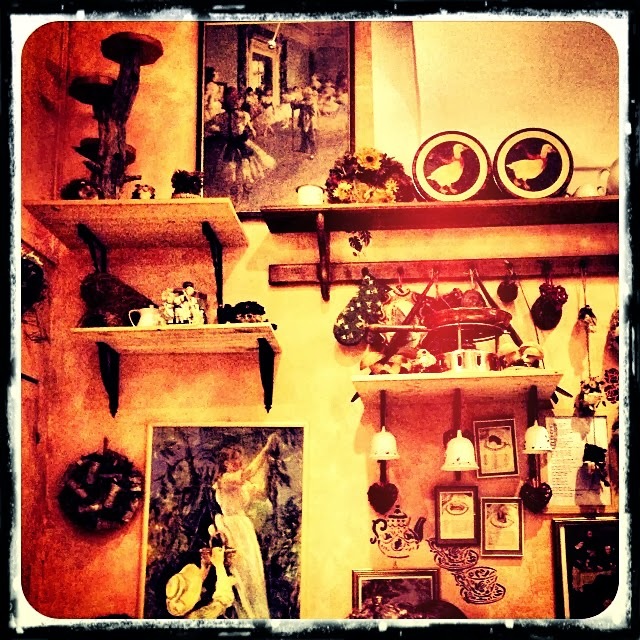 The place is very tiny, but so warm and lovely, with doilies, old jars, vintage stuff and Impressionists posters on the walls. Their cuisine is inspired to Brittany - so, I say, a totally perfect mix between the best part of France and of England. I've always been there for lunch, but this Saturday Tabby & me had other plans: nonetheless for her a visit to Turin without a stop by Olsen would have been, fairly enough, incomplete; so we sneaked in for an afternoon snack. The American coffee with cinnamon & orange peels and the ricotta & honey cheesecake I had were memorable. But go ahead and order whatever mostly inspires you: I know the choice is sometimes just difficult, but trust me - I usually change every time I go and so far I've never been disappointed! 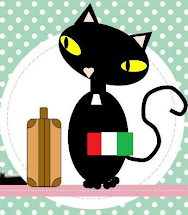 [*] ...Did you know that holding a specific pin situated in Piazza Castello will bring you good luck?? That's almost the same as walking over the attributes of the bull located on the soil under Piazza San Carlo's arcades, but that has to happen by chance to work out, you don't have to modify your pace in order to put your foot above them - it just has to come naturally. But, as for this, it's a ritual you have to do - and, while of course I don't believe it (as a black cat I just cannot be superstitious), I like the idea that it could be a metaphor of going to look proactively for your fortune, master it yourself. It's the pin of the chain that delimites the entrance gate to the Royal Palace, the one guarded by the Castor & Pollux twin statues. Legend says that the Dioskouri statues mark the point of balance between the positive and negative forces that flows along Turin: Piazza Statuto, with its monument to the victims of the Frejus topped by an angel with a star on his brow (which probably represents Lucifer), is the core of the dark, evil energy; Piazza Gran Madre and its misterious church are the convey point for good, positive flow; while this gate represents the balance of the neverending fight between these two forces - a sort of Ying & Yang under the Mole. Moreover, Greek mythology tells us that the Dioskouri's aim is to help humanity: they were invoked by sailors and travellers to get favourable winds - so what could be more appropriate than doing this ritual myself as well? [*] ...Did you know that it looks a bit French (but it isn't)?? Maybe it's the geographical closeness, or perhaps the fact that Savoy actually came from France, but it's true that there are many resemblances and recalls with the cousins across the Alps. Turin's architecture and planimetry has a Parisian taste - just to mention the most evident. But still it has its own identity that turns the French appeal into an actual, unique Turin's essence. French is just the appearance, Turin is the soul. 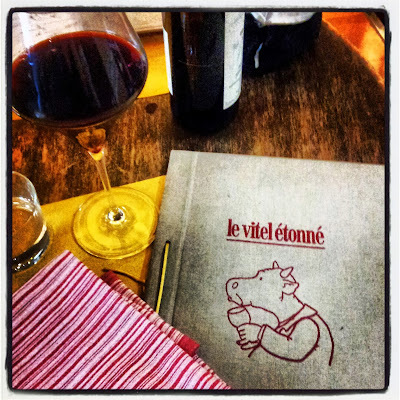 So, when we stepped into a cosy and nice restaurant bearing a French name (Le Vitel Etonné, via San Francesco da Paola 27) we were kinda expecting some nouvelle cuisine's specialities - but instead the dishes were all original creations based upon traditional Piedmontese dishes. 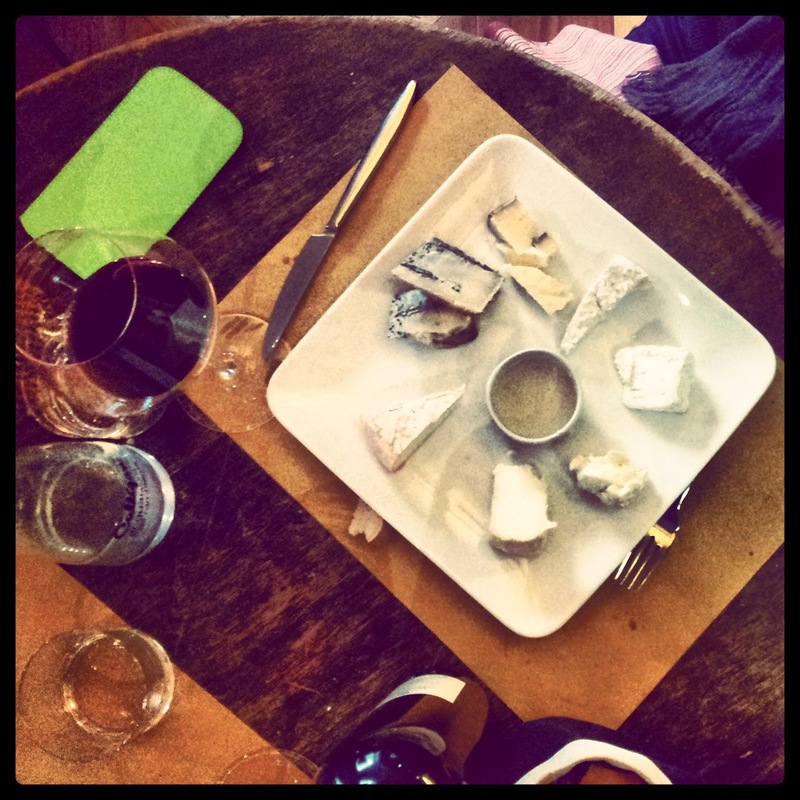 We had cheese, so much cheese - we do love cheese!! And in this Turin shows again his French-like soul: Piedmont offers a huge variety of tasty qualities. They serve them in the classic way you can experience here: in gradation of strength and accompanied by a small pot of honey - perfectly enjoyed with a glass of robust Dolcetto. And there was some savoury blue cheese on my mouthwatering gnocchi . 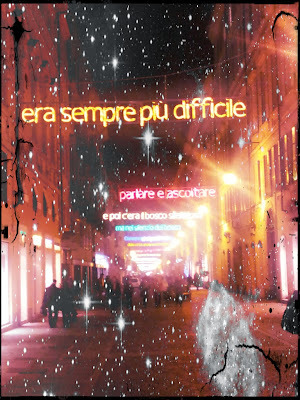 [*] ...Did you know that it doesn't have Christimas lights - it has Luci d'Artista?? Christmas time is over since a week already but the lights in the streets of the city's center have been kept until this weekend. No wait - I just have it because I'm lazy and I haven't felt like putting it in the basement yet. 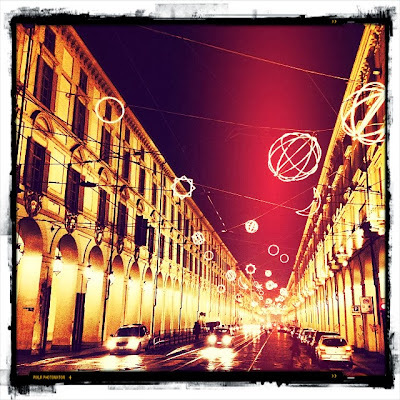 Turin has done it because its Xstmas lights are actually installations designed by a bunch of famous architects and artists which make strolling around the center really enchanting since more than 10 years. In Via Lagrange there is one of my favourite installations: the lights do tell a story... - and, every given time, even if the story hasn't changed a comma in the past 10 years, I'm able to walk along the whole road with my nose stuck up in the sky to read the story, without even noticing the beautiful shop windows around me.